It's no secret that Amish furniture is built to withstand the test of time. The Louis Philippe 2-Piece Chifforobe is certainly no exception. 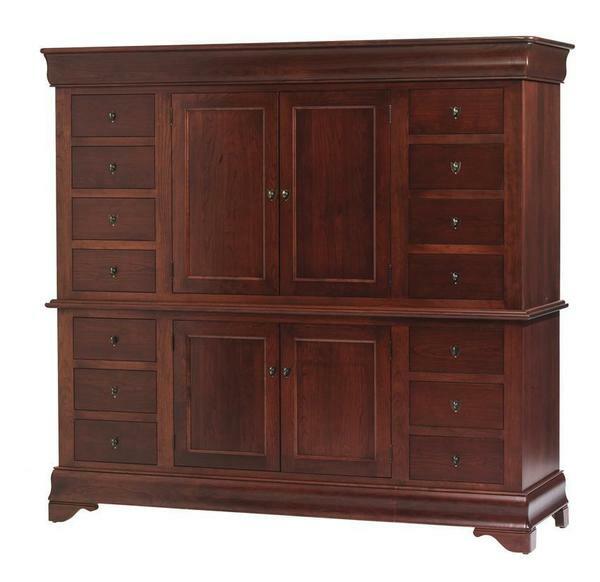 Crafted from hand selected pieces of hardwood and skillfully constructed, this Chifforobe will make for a unique piece of bedroom decor that will leave a lasting impression. Our Amish Bedroom Furniture Chifforobe Chests are handcrafted from solid wood by experience Amish craftsman using Old World techniques. These beautiful Chifforobe Chests will bring charm into your bedroom decor. The multiple drawers and added storage space in these chests will help keep your clothes and linens organized while also adding style to your master or guest bedroom. Don't forget to add the aromatic cedar drawer bottoms for that beautiful, natural cedar scent. Founded out of respect for Grand Elegance, our Louis Phillippe Suite abounds with strength and beauty from the inside out. Wide 5" Solid Hardwood moldings gently the crests and foundations of this well-built bedroom. The framework for these special pieces are hand-assembled with perfection in mind, giving each one an heirloom quality that can only be expected from such highly skilled craftsmen. Enjoy up to 12 unique configurations of red oak, quartersawn white oak, cherry, maple or brown maple in your favorite finish. Offered with stain, glaze, paint or distressed finish.